I'm late to the brown(ed) butter party, I know. But either way, here's my offering. 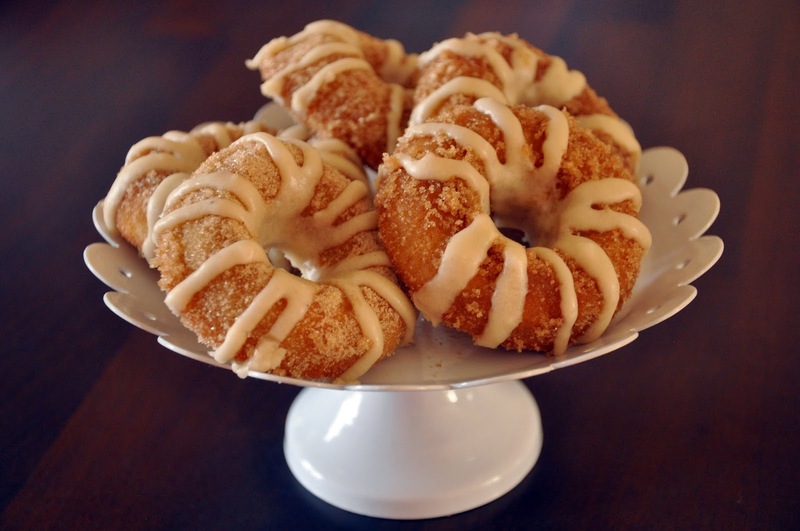 Baked doughnuts, rolled in cinnamon sugar and topped with a drizzle of browned butter glaze. These doughnuts took me an hour to make from start to finish, which is a feat in itself. With minimal mess and effort, these mini guys are great if you're short of time. And if you haven't tried browned butter before now, its essentially burnt melted butter...sounds appetising? No, didn't think so. But when you call it beurre noisette it sounds heaps better! In recipes it lends a rich, nutty depth and smells incredible. Heat the oven to 160 degrees and lightly brush a doughnut pan with oil. 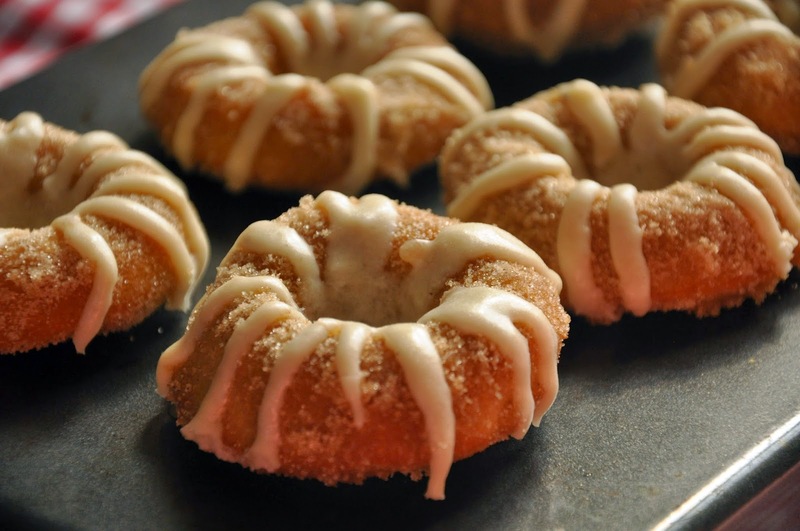 If you don't have a doughnut pan you could use a small cupcake tray or similar instead. Add the flour, baking powder, salt and cinnamon to a large mixing bowl and gently whisk. (This does the same job as a sieve, but much easier). Add the sugar and stir together. In a separate bowl or jug, whisk together the milk, egg, oil and vanilla. 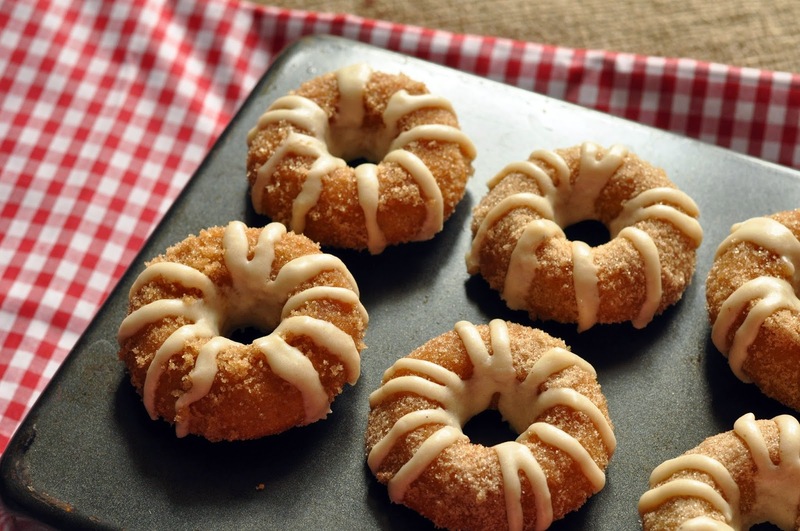 Using either a teaspoon or a piping bag, fill each doughnut hole 3/4 full with the batter. Bake in the oven for 8 - 10 minutes, until firm and springy to touch. Prepare the cinnamon sugar coat whilst the doughnuts are baking. Put the melted butter in one bowl, and the sugar and cinnamon mixed together in another. When the doughnuts are slightly cooled from the oven (this should take only a few minutes as they're so small), gently dunk each doughnut into the butter before rolling in the sugar mix. Place on a plate and leave to cool. For the glaze, start by making the browned butter (notes below). Use a pan with a light colour bottom to monitor the colour of the browning butter easier. Place on a low heat and leave to melt, stirring occasionally. The butter will foam up and start to brown. Continue to watch and stir (occasionally) as the butter turns from a lemony-yellow colour, to a golden tan and then toast colour. This should only take a few minutes for this small amount. Remove from the heat and pour into a heatproof bowl to cool slightly. Sift the icing sugar into a bowl and add the salt. Continue to add the wet ingredients and whisk together. Start with 2 tablespoons of milk and add more as necessary to get a smooth, glossy glaze. Use a piping bag or spoon to drizzle over the cooled doughnuts. N.B. Browned butter is the result of the butterfat and milk solids separating when melting. The milk solids will sink to the bottom and start to brown first. These dregs are perfectly fine to use in recipes, providing you don't burn them. However, I drained them for this glaze as it would look a little unsightly. But, in a cookie dough, for example, they would be completely fine.